Hey, Mousetalgia friends! Nicole again, this time with a trip report. 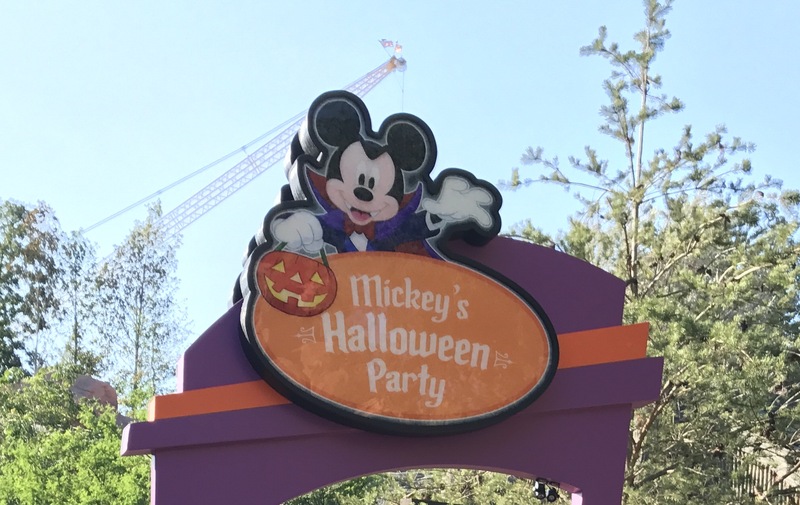 Having attended the kick-off of Mickey’s Halloween Party 2017, I’m back to share some details of the celebrations! Before we begin, however, I have a bit of bad news for anyone who was considering buying a ticket and has not yet done so: it appears as though the event is already sold out for the rest of the year. While that’s too bad, I’ll nonetheless share some of the happenings here in the hopes of providing insight into the experience. 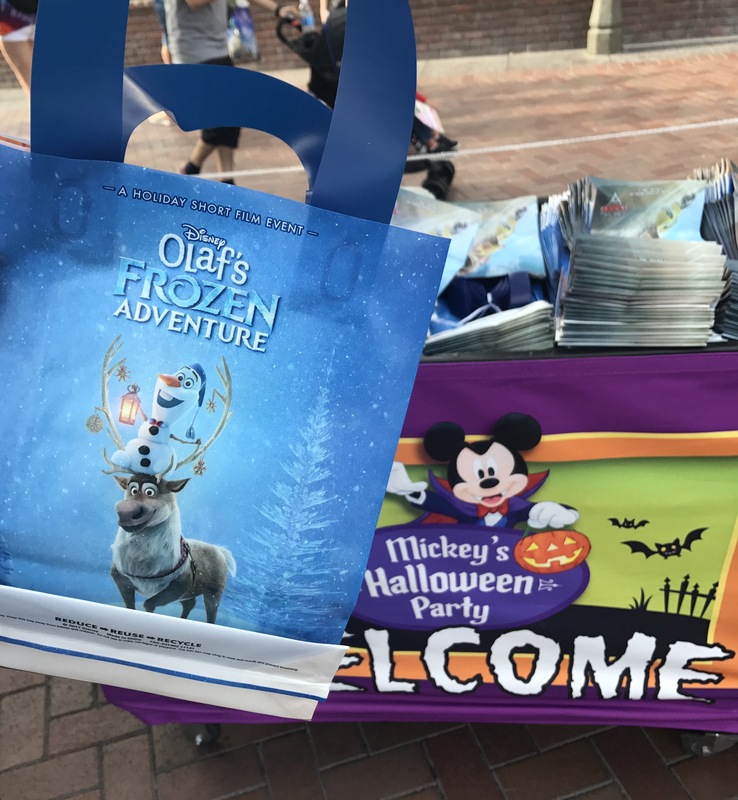 While the trick-or-treating didn’t officially start until 6 pm, party guests were able to enter Disneyland Park as early as 3 pm (note: party start times vary by date). Sparkly wristbands on, we rolled into the park in full costume while it was still daylight (something I highly recommend, as it felt like the evening went by very quickly!). First stop: picking up our bags for trick-or-treating! Once it was 6 pm, it was time to get going! A trick-or-treat station in Fantasyland. Note the crane in the background, which is part of the construction for Galaxy’s Edge, the upcoming Star Wars-themed land. 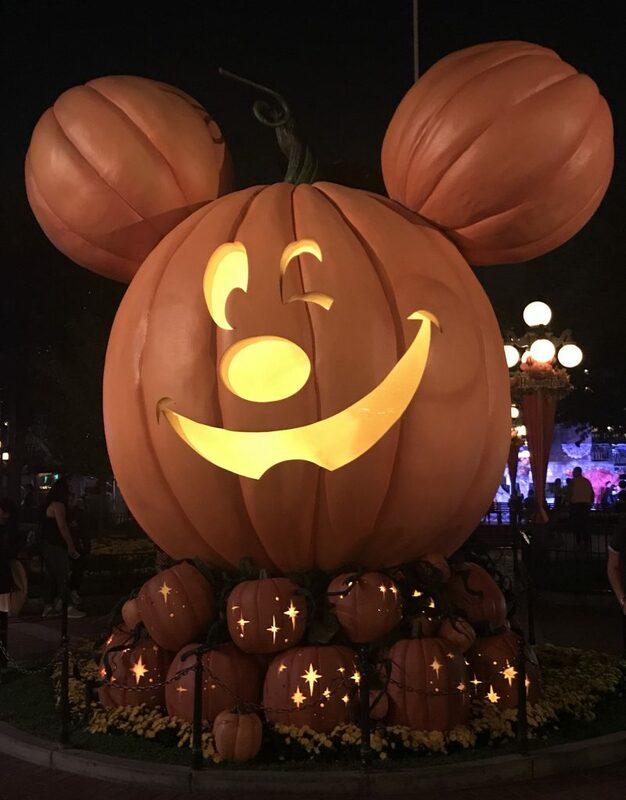 Disney does provide maps unique to the Mickey’s Halloween Party experience that indicate where the various trick-or-treat stations are located, however I never ended up using mine. It was my experience that we happened upon plenty of stations without needing additional guidance. The first handful– not too shabby! 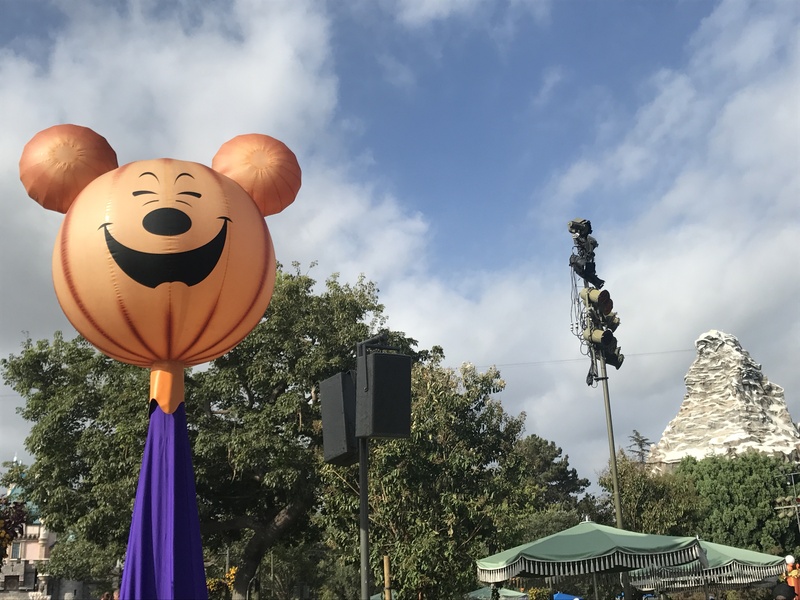 The trick-or-treat stations seemed to have the longest lines of anything else in the park (meaning that the attraction lines were shorter! ), however, that said, they really weren’t that bad. It was enjoyable to look at what everyone else was wearing, so the experience was pleasant and went by fairly quickly. 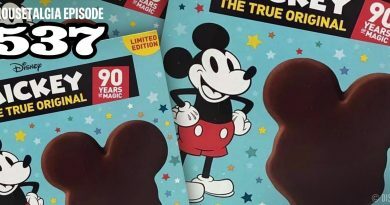 The nice thing is that each station really consisted of multiple little candy kiosks– meaning that you could get in one line in Tomorrowland, for example, and easily hit up like five candy kiosks, one right after another. Speaking of Tomorrowland, check out the themed design of this candy kiosk. 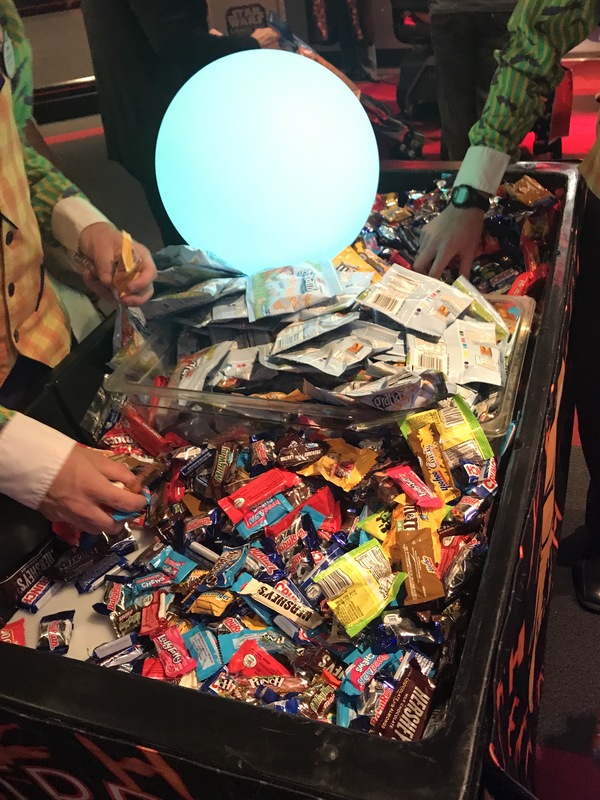 The candy handfuls were pretty generous, and I believe guests could go through the lines an unlimited number of times. (We personally didn’t feel a need to, since there were plenty of other things to see and do.) 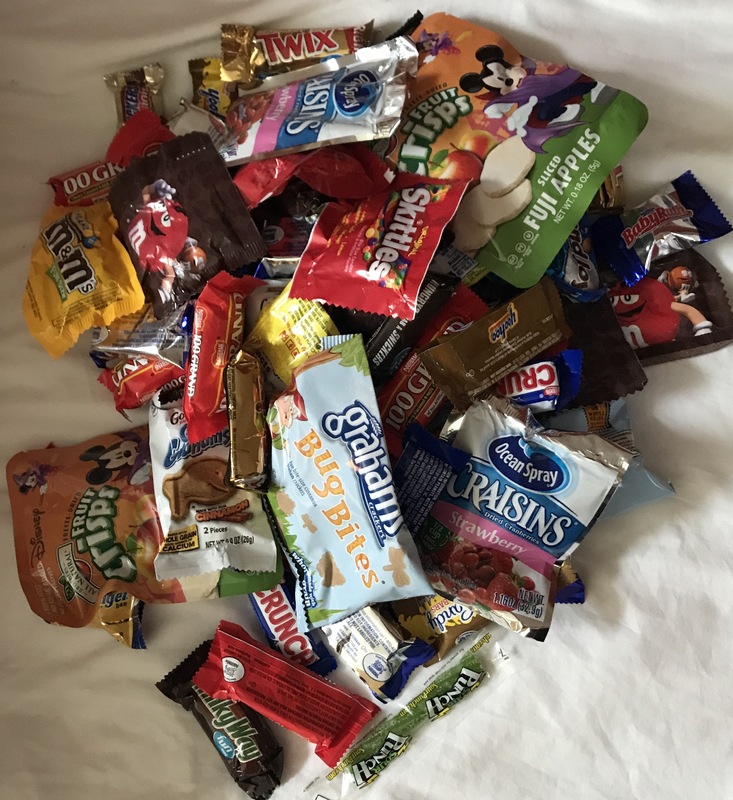 Recommendations to either bring a backpack in which to dump everyone’s candy, or a large reusable bag in which to store the candy under a stroller are a good call– the treat bags can become heavy quickly. So much power for a cast member to wield responsibly! 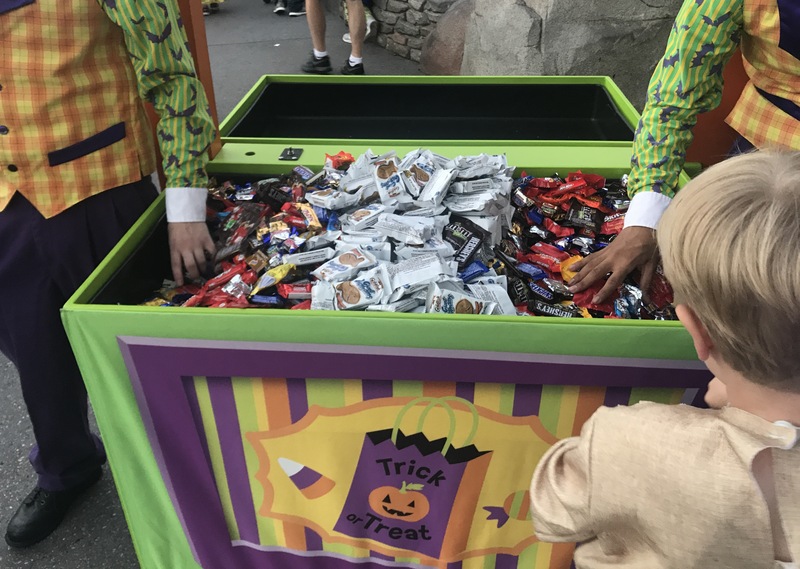 A trick-or-treat station located at the entrance to the upcoming Galaxy’s Edge (the Star Wars-themed land located near Frontierland). 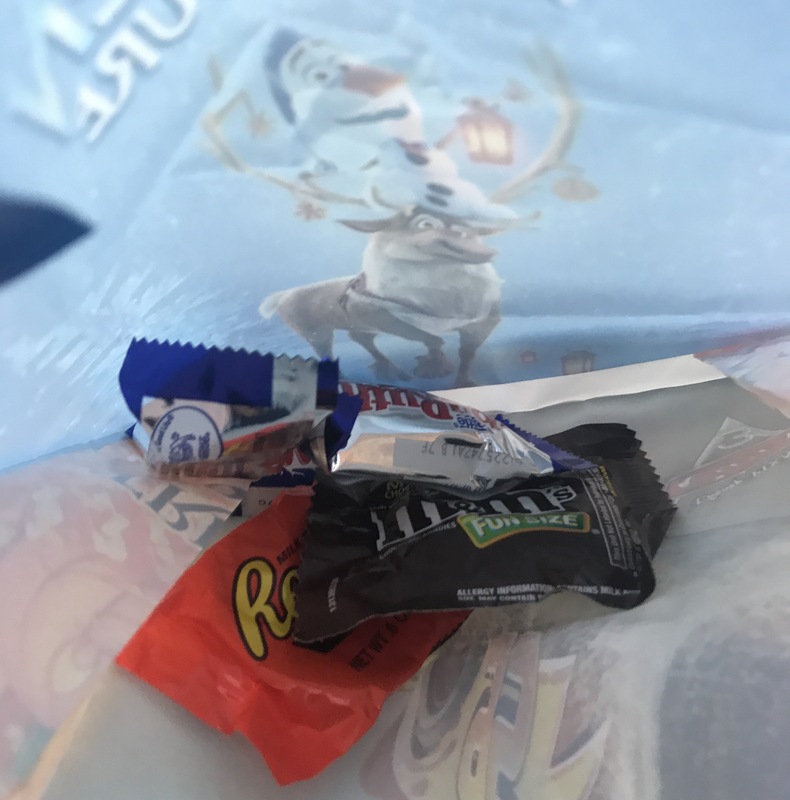 Pictured below is the candy haul I took home. Pretty impressive given that I put in the bare minimum* in terms of effort! Not too bad of a haul for such little effort! 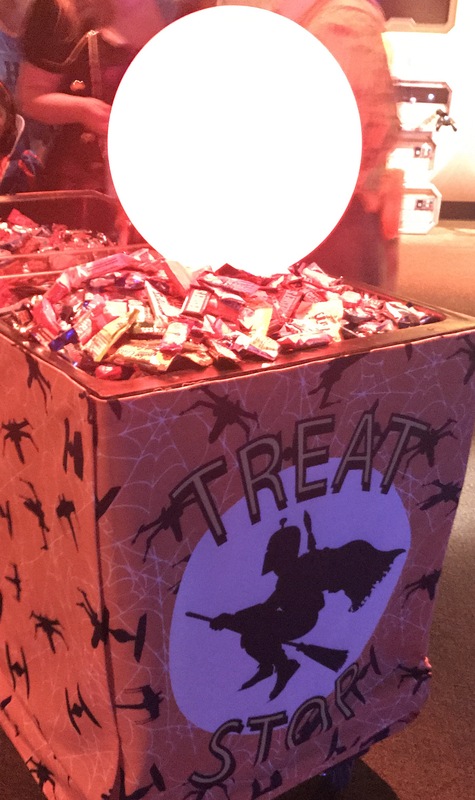 In addition to candy, there were other treats handed out (including, for example, fresh apple slices, baby carrots, graham crackers, freeze-dried apple slices, strawberry-flavored dried cranberries, and Goldfish crackers). 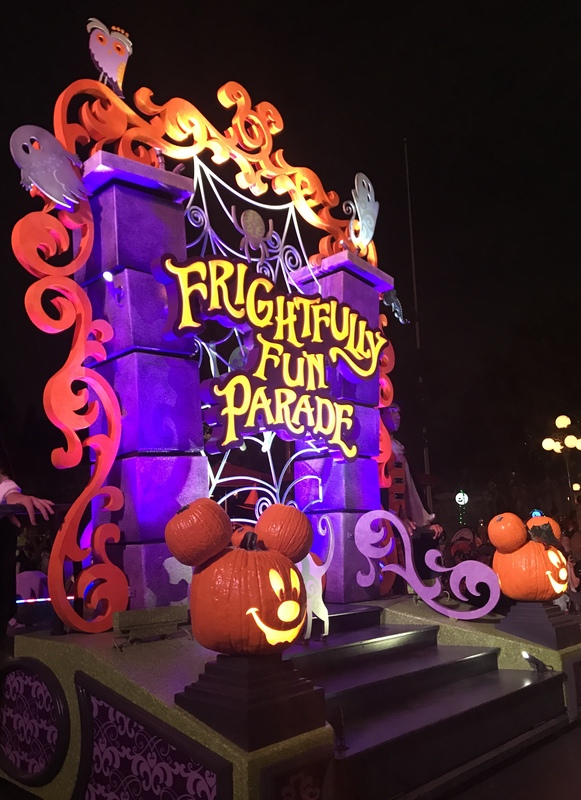 There were two showings of the Frightfully Fun Parade that night, and we attended the earlier one. 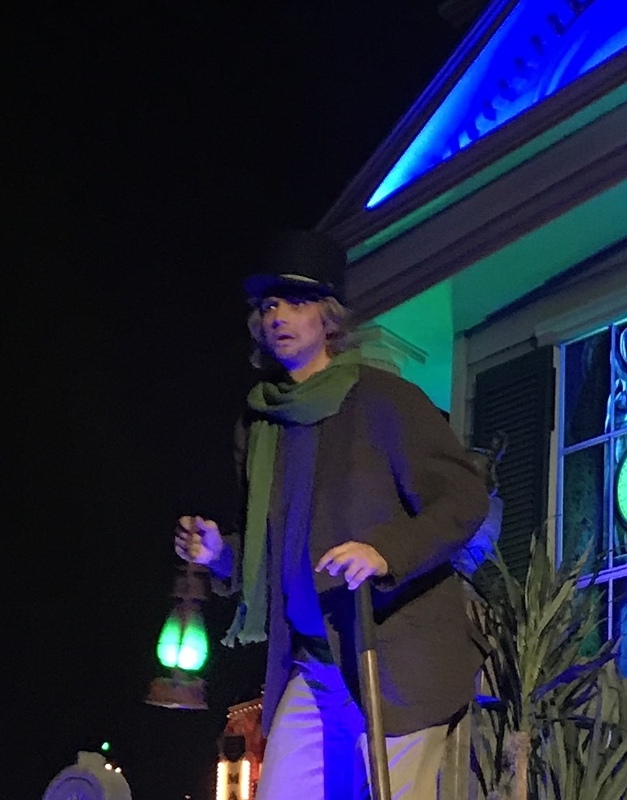 A “pre-parade” featured some terrified citizens from the town of Sleepy Hollow running in fear and warning guests of the impending arrival of the Headless Horseman, whose ominous figure trailed in their wake. After the pre-performance, there was quite a delay before the actual parade began. 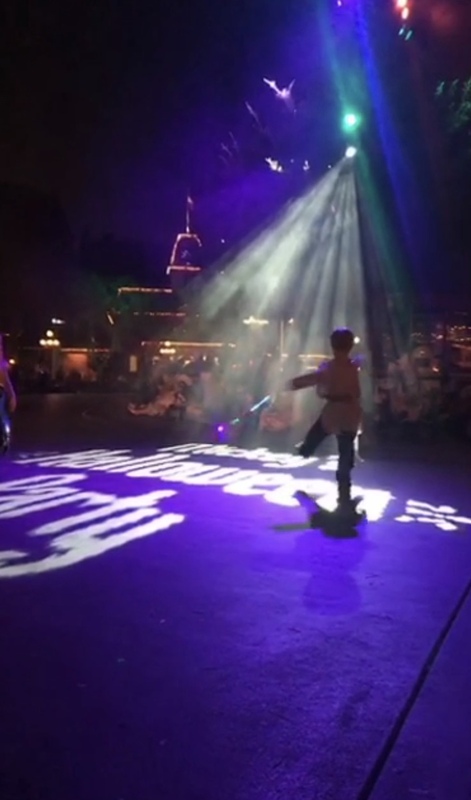 My six-year-old brother seized this opportunity, along with the open space in the Town Square street and the fun, spooky lighting, to create his own personal dance floor. He was joined by an adorable, teetering Sally and a pint-size Belle in a yellow ball gown, among others. I mean, can you blame him? Look how awesome this dance floor is! Finally, the parade began, and things were looking promising– until my step-sister uttered the words that would curse us all. “What is this like 80’s bop music that we’ve got going on?” she asked. Consequently, the parade came to a complete standstill– and remained that way– for twelve minutes. Remarkably, the team of dancers nearest us kept going, dancing and exuding energy the whole time, while the “80’s bop music” played on a seemingly endless loop. Somehow, their smiles never once faltered. The “You Go Girl” award of the evening, however, goes to Minnie Mouse, who for, again, twelve minutes straight, continued to dance her heart out with an upbeat spring in her step that was both awe-inspiring and exhausting to witness. At one point, a cape thrown with a little too much dramatic flair took down part of a small piece of the float’s pumpkin props. Things were beginning to look bleak, when suddenly– the parade started back up! 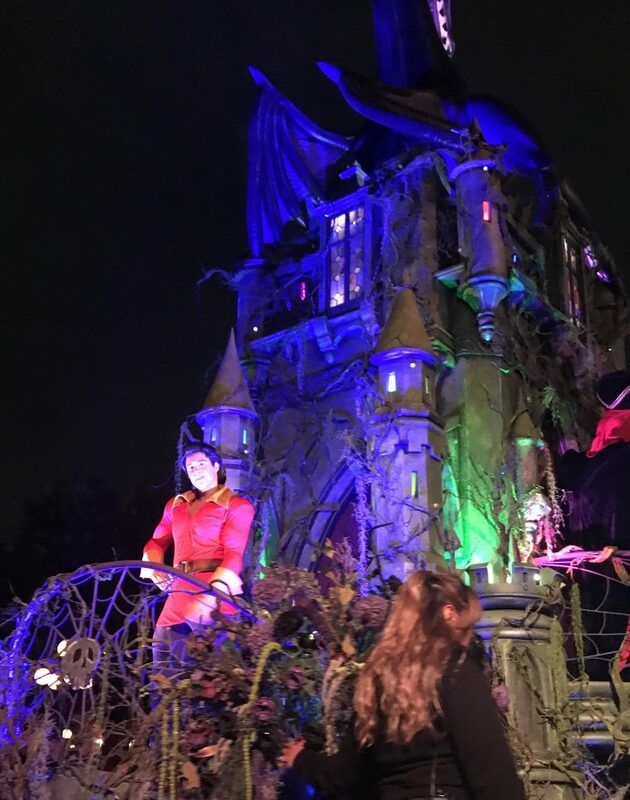 It turns out that something had happened with “The Nightmare Before Christmas” float, and Jack, Sally, and Zero had to make an early exit. Despite the rough start, the parade ended up being completely awesome, and was unique to anything I’ve ever seen in the park. The best floats, in my opinion, were those for the Haunted Mansion. 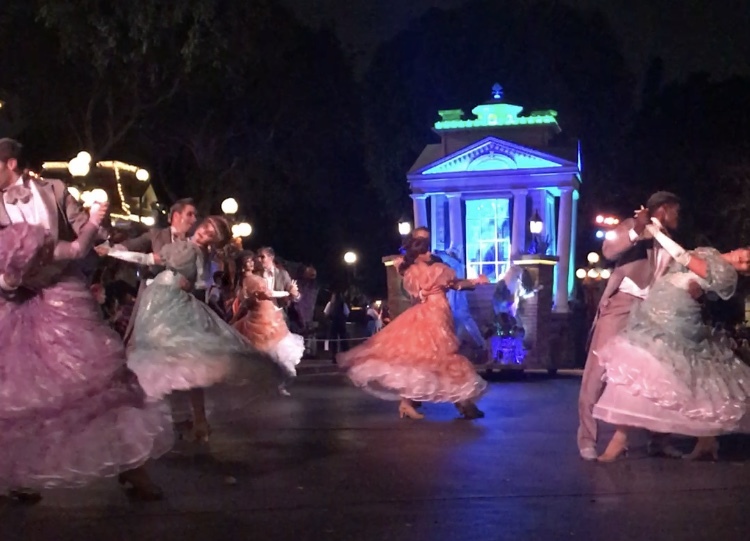 I was completely blown away by the ghoulish ballroom dancers who careened our way via a combination of elegant spins and jerky zombie movements reminiscent of Michael Jackson’s “Thriller” music video. 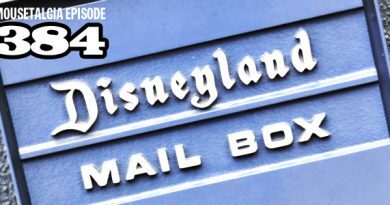 You know that game where you think about what job you’d choose if you could have any job at Disneyland? I decided right then and there that I would be one of the undead partygoers from a previous century, complete with ghoulish makeup and graceful, swirling skirt. Undying love never looked so good. 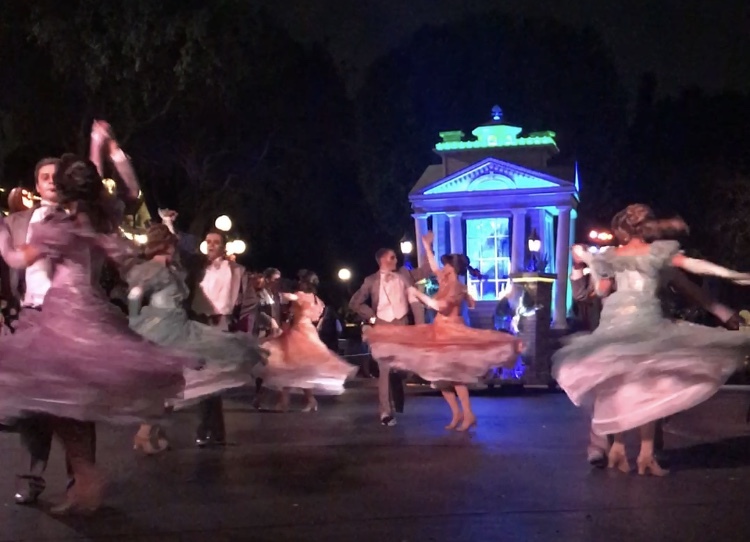 The dancers were followed by the Haunted Mansion’s three beloved Hitchhiking Ghosts. Unfortunately, I totally failed to get a decent photo of them, and so it seems they will remain elusive for the time being. If you squint, you can pretend you can kinda/sorta see them in the background. 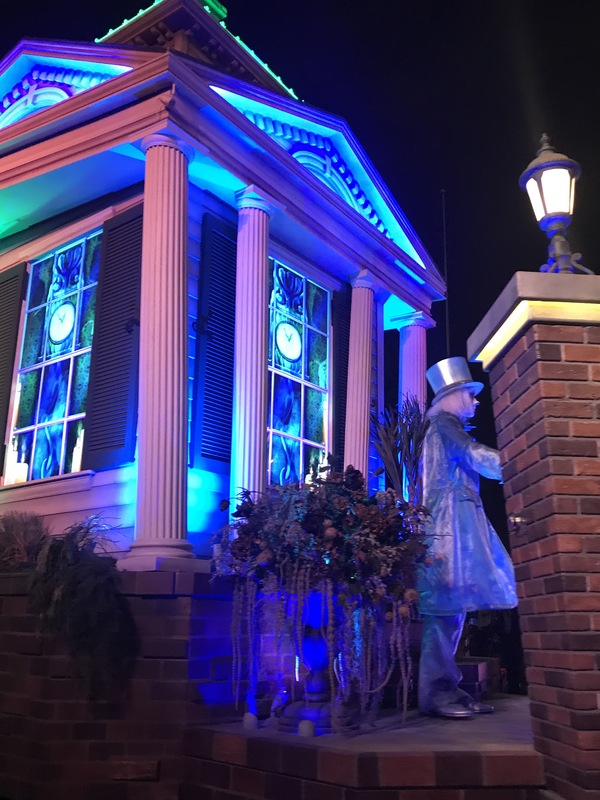 The windows of the Haunted Mansion float were really cool– animated and emitting an eerie blue light. 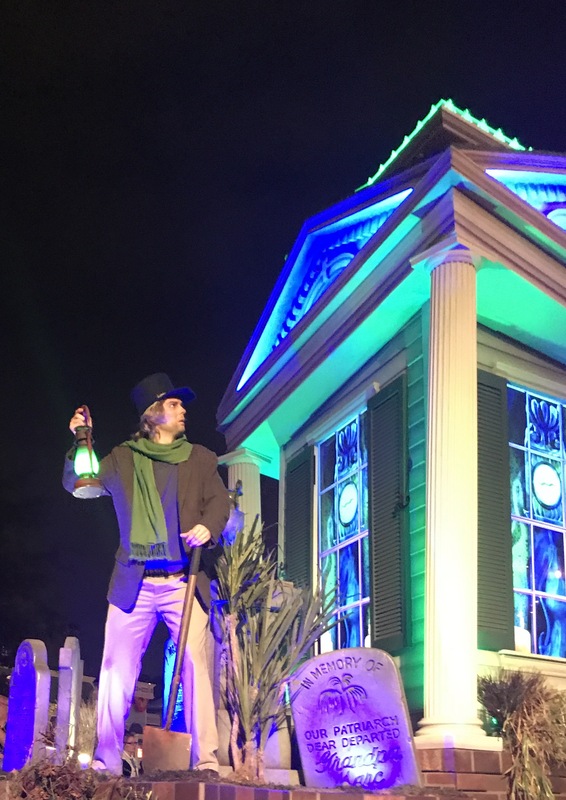 Finally, the terrified Haunted Mansion groundskeeper, who stood holding his lantern while peering into the dark, trembling, followed by a group of somber, ghoulish gravediggers. Note the engraving on the tombstone– a great little nod to Marc Davis. Sure enough, there was a matching one for “Brother Claude” [Coats] on the other side! The gravediggers twirled their shovels in the air and dragged them on the concrete, creating one of the most obnoxious sounds I’d ever heard in my entire life. I cringed– until I realized that the friction of the metal on the pavement was creating dramatic sparks, at which point I was delighted. Clearly regretting his decision to accept this job. Last, but not least, almost every conceivable Disney villain you can think of was there to pull up the rear, including some of the lesser-seen ones. 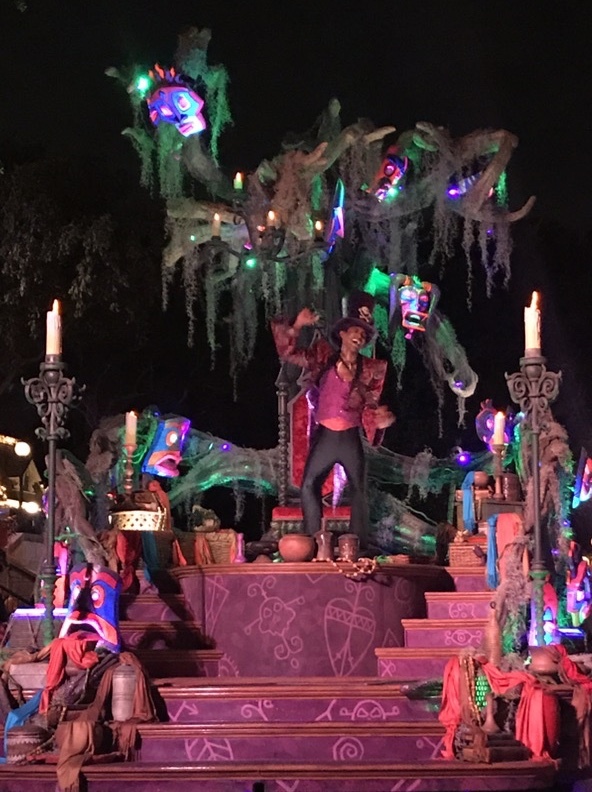 We saw the likes of Dr. Facilier, the Queen of Hearts, Lady Tremaine and her shrill daughters, Gaston, Jafar, Hades, Ursula, Frollo, etc.– and that’s only taking into account those visible to our side of the crowd! It was at this point near the end that the audio decided to go out. Fortunately, the audience was there to cheer the villains on for their final moments. Gaston indulged the crowd in one more laugh as he flexed and flaunted on the back side of the last float. Dancing skeletons scuttle across the building fronts of Main Street, USA in a throwback to Disney’s earlier “Silly Symphonies”. 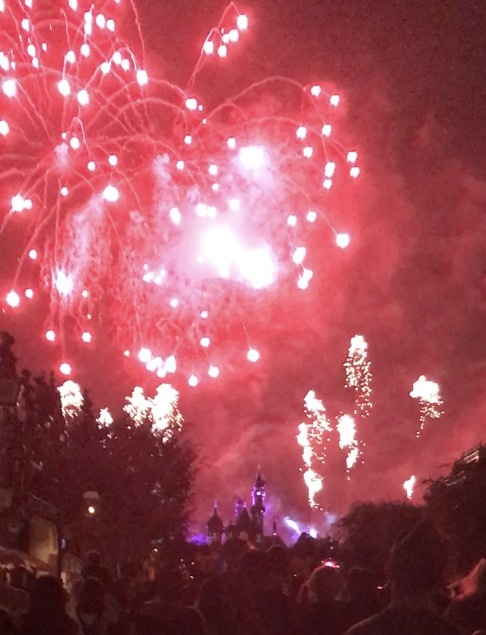 A villainous fireworks show immediately followed the first parade. 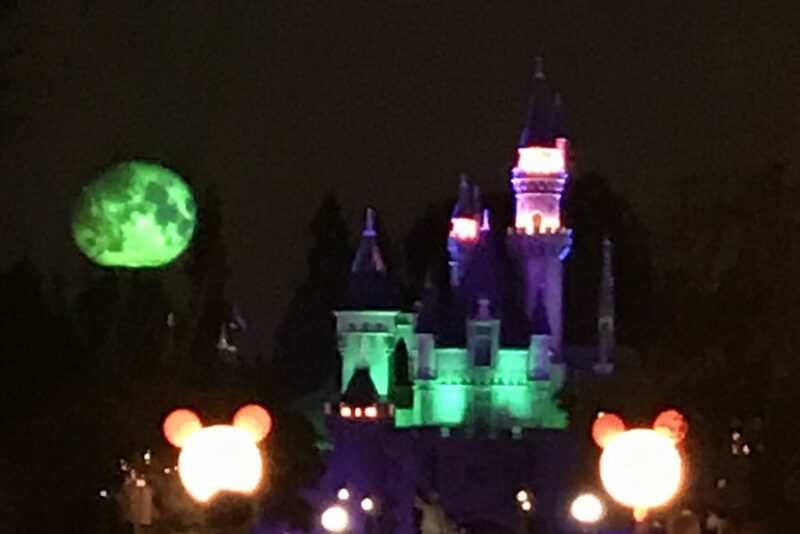 Spooky sights were projected onto Sleeping Beauty’s castle while orange, green, purple, and red lights alternately lit up the castle and the night sky. Our favorite ghost dog, Zero, made an appearance, his orange nose glowing in the night as he floated playfully through the sky. The costumes were one of the most fun parts of the evening, with children and adults alike dressed up head-to-toe. It was a fantastic place to enjoy well-executed group costumes (think “101 Dalmatians” with Cruela de Ville in tow, “Finding Nemo” complete with a flock of seagulls and a jellyfish, etc.) as well as unique individual costumes (I see you, Boo’s door from “Monster’s Inc.”! 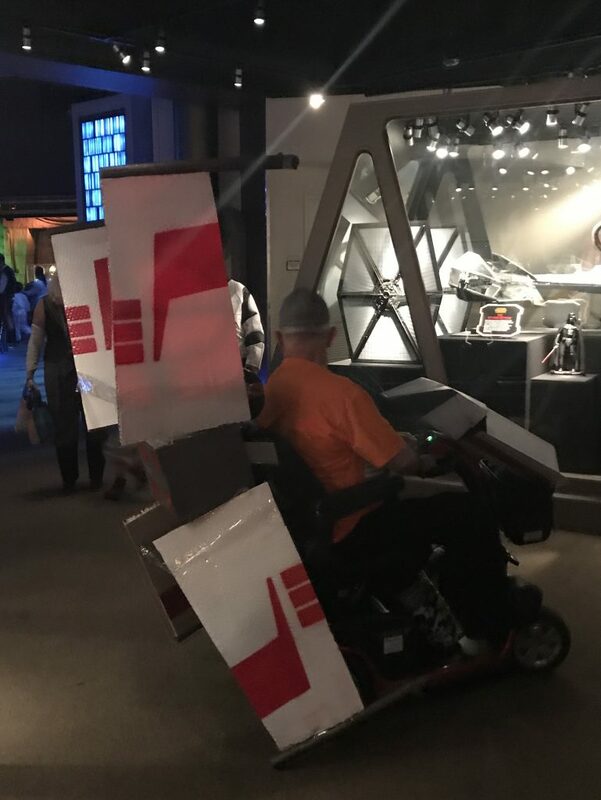 I salute you, older gentleman on a motorized scooter-turned-into-Star-Wars-X-Wing-Starfighter!). I’m giving the Cutest Costume Award to the young parents dressed up as Princess Jasmine and Aladdin, and their little baby who was dressed up as the monkey Abu, complete with tiny vest and pint-size red fez hat. This gentleman’s costume was simply wonderful! In addition to converting his scooter into an X-Wing Starfighter, he donned a t-shirt with a design resembling the orange jumpsuits worn by pilots of the Rebel Alliance. What a delight to see an Alice, Mad Hatter, White Rabbit, and Queen of Hearts walking near the teacups! I personally enjoyed showing up as Rey from “Star Wars” (along with a Princess Leia and Luke Skywalker), and being able to take some really fun photos with Chewbacca and Darth Vader in the park. 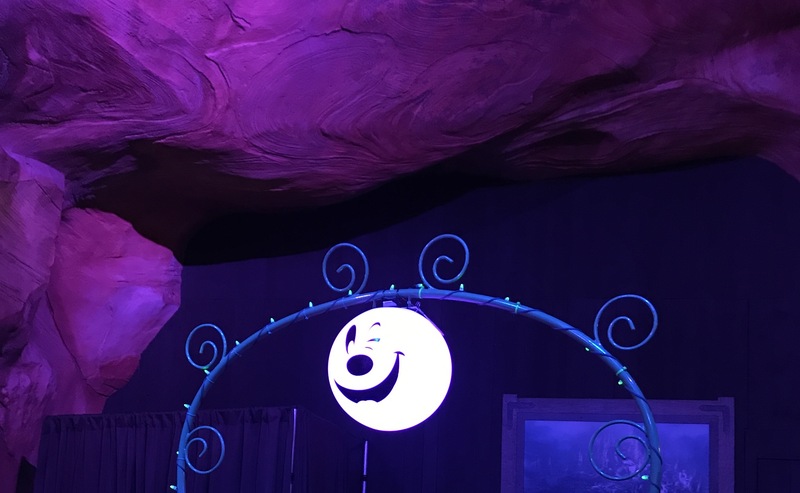 Of course, there were so many special little Disney touches that made the evening spooktacular and magical, which I am simply not doing justice. 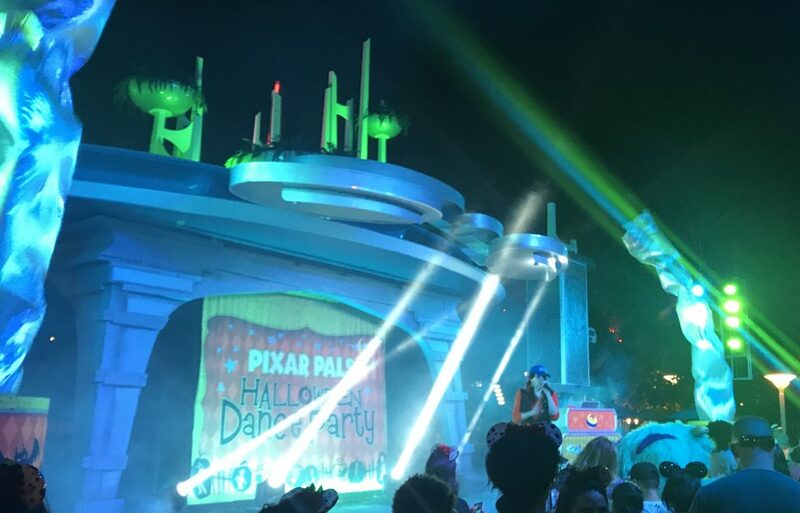 For example, there was a Pixar Pals Halloween Dance Party in Tomorrowland, where guests could boogie down with the likes of the Incredibles, as well as Pixar faves like Sully from “Monsters, Inc.” and the Toy Story crew. 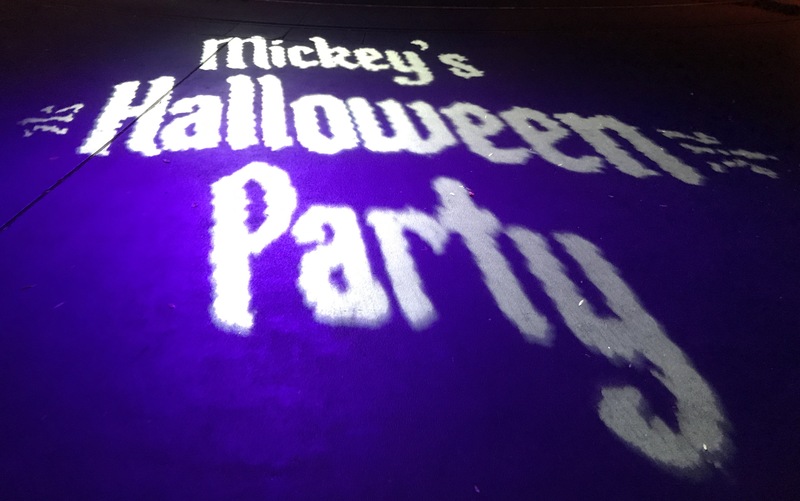 The Pixar Pals Halloween Dance Party, which took place at the Galactic Grill. 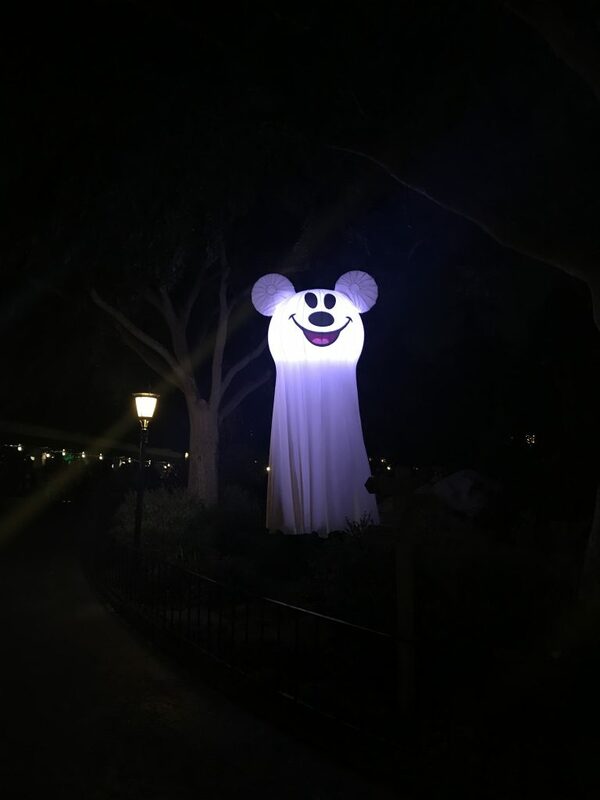 There were great decorations throughout the park, such as this glowing ghost. In Frontierland, creepy fog, spooky lighting, and scary sounds made for a more ominous experience. 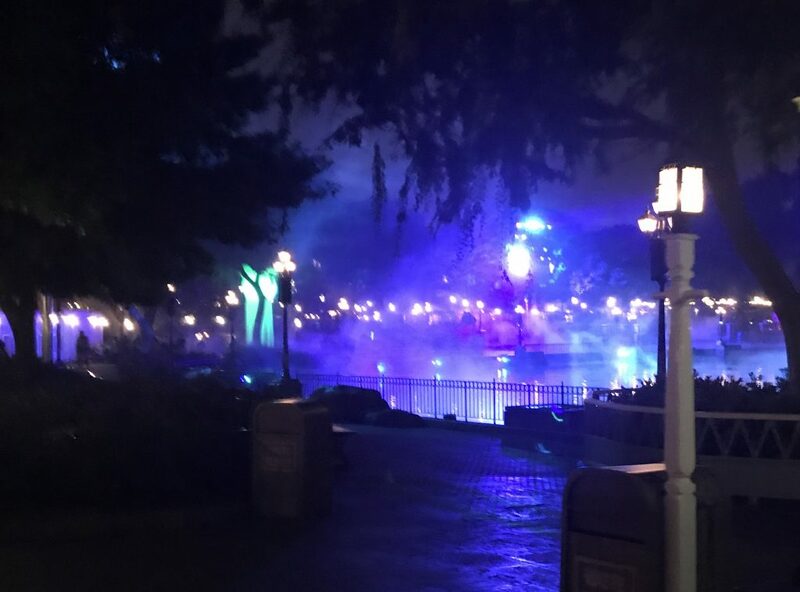 Fog drifting over the Rivers of America. 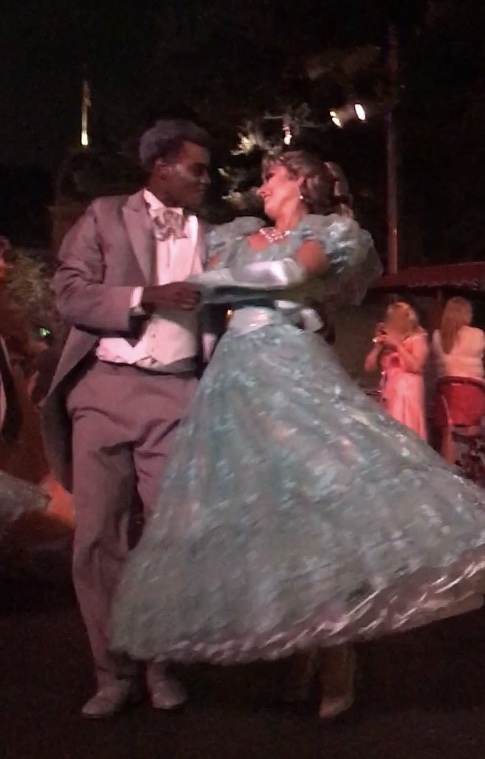 We spent so much time in Fantasyland and Tomorrowland, that we did not end up seeing a lot of what was going on in Frontierland, New Orleans Square, and Critter Country. While I have no regrets about this (we had a blast! ), if I were to do the party again, it would be fun to check out what was going on in these areas (especially since they seemed a little on the scarier side). Another extra, guests had access to meet and greets/photo opportunities with Disney villains such as Maleficent and Gaston. Gaston can be seen flexing in the lower right-hand corner. 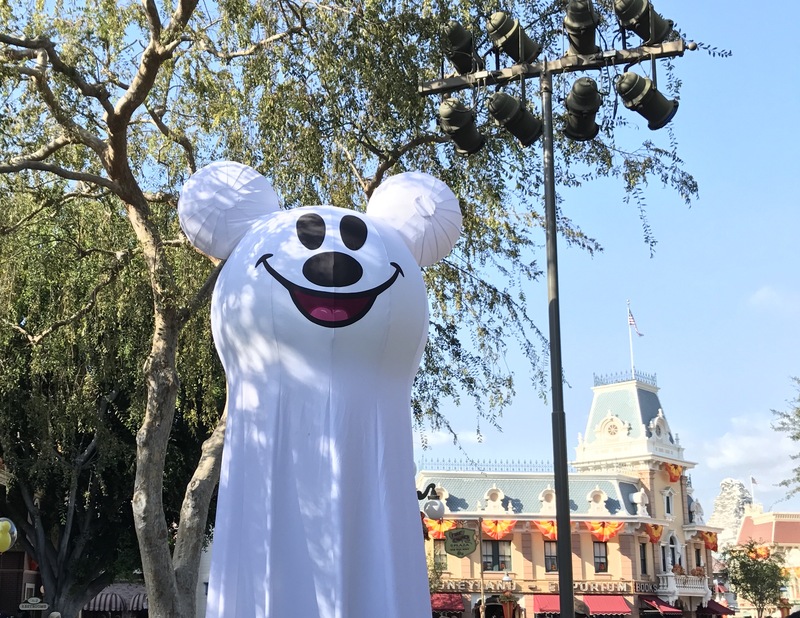 A notable highlight of Mickey’s Halloween Party was that a smaller, controlled guest list meant there were fewer people in the park. This, in turn, meant way shorter lines for the attractions. We essentially walked right onto rides like King Arthur’s Carrousel and Dumbo, which is basically unheard of during normal park hours. For many, that alone right there may be worth the cost of admission. 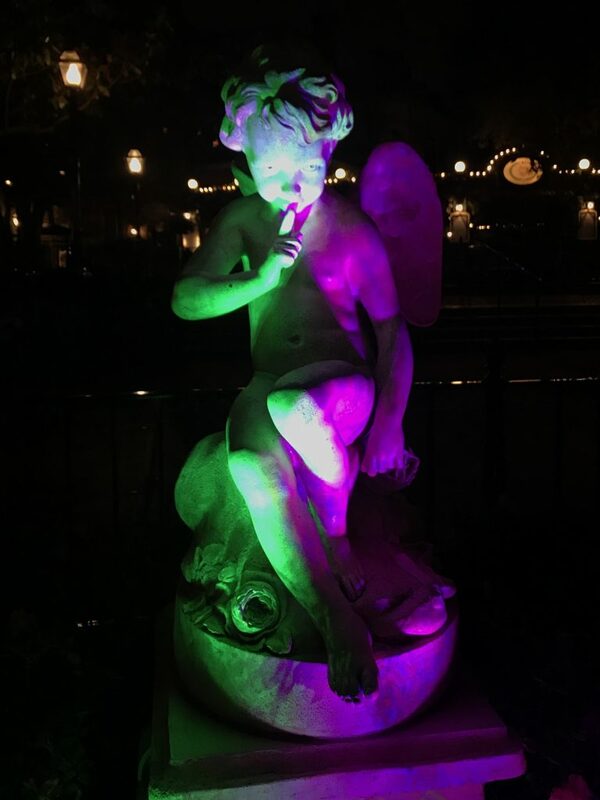 The Hands-Down Creepiest Thing I Saw All Night Award goes to this terrifying statue, located on the promenade of the Rivers of America waterfront. 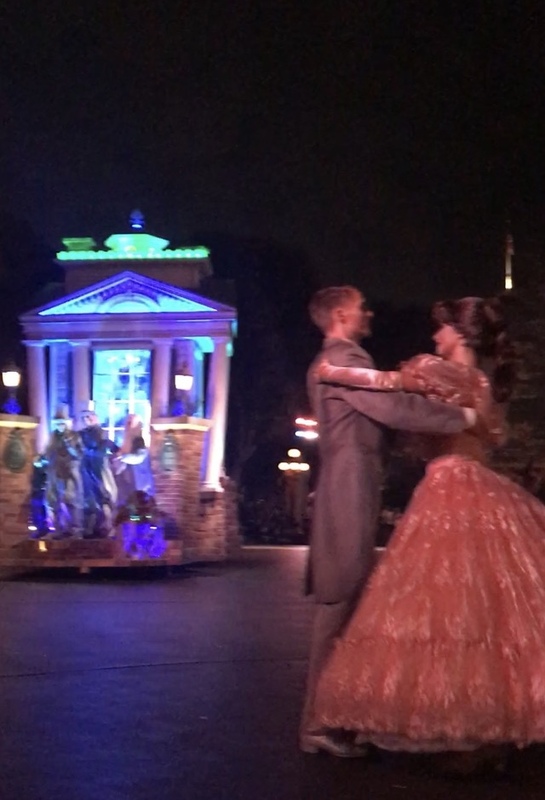 Two poor cast members tasked with managing the nearby photo station queue were forced to look this thing in the eyes for the entire evening. “I swear, I don’t think I’ve ever see that statue before today,” one of them commented with clear horror. My question is, has anyone??? Where did this thing come from?? It’s like it’s staring into your soul. 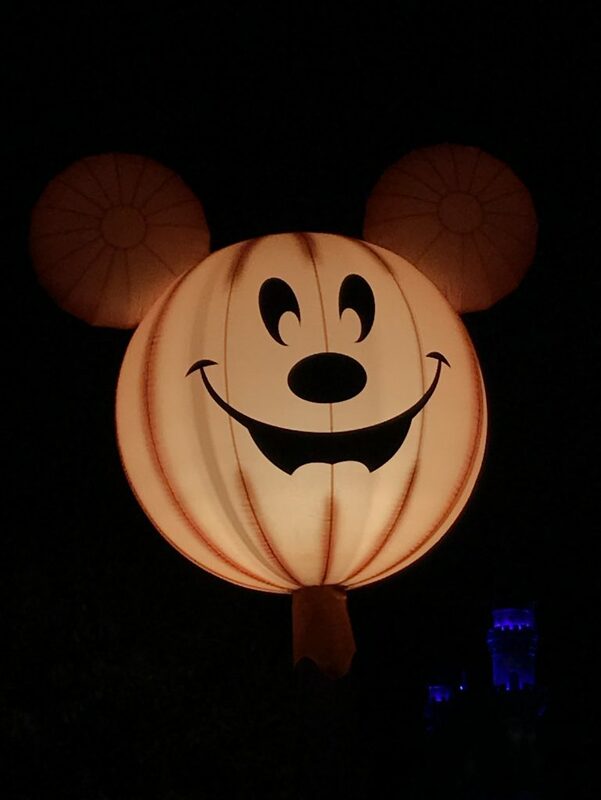 This was my first time attending Mickey’s Halloween Party, and I thoroughly enjoyed it! I would definitely do it again, although it is expensive. 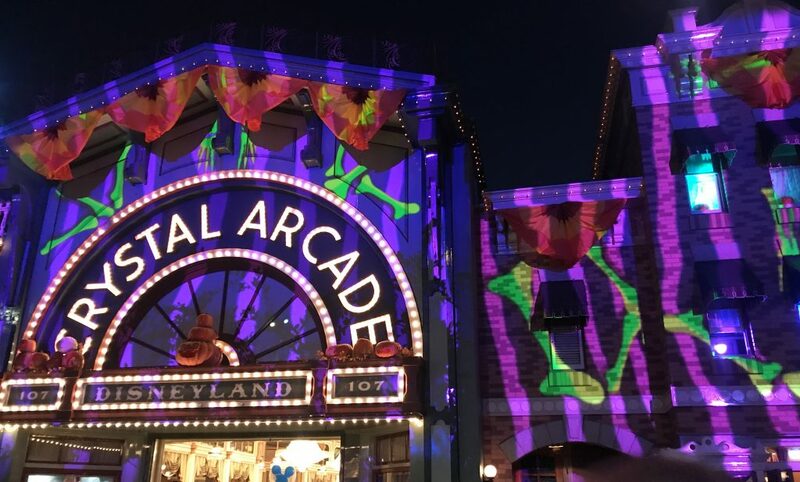 If I were not an Annual Passholder and had the luxury of some extra days in the park, I would consider doing just the party at night, and not going into the parks earlier in the day, to conserve both energy and money. 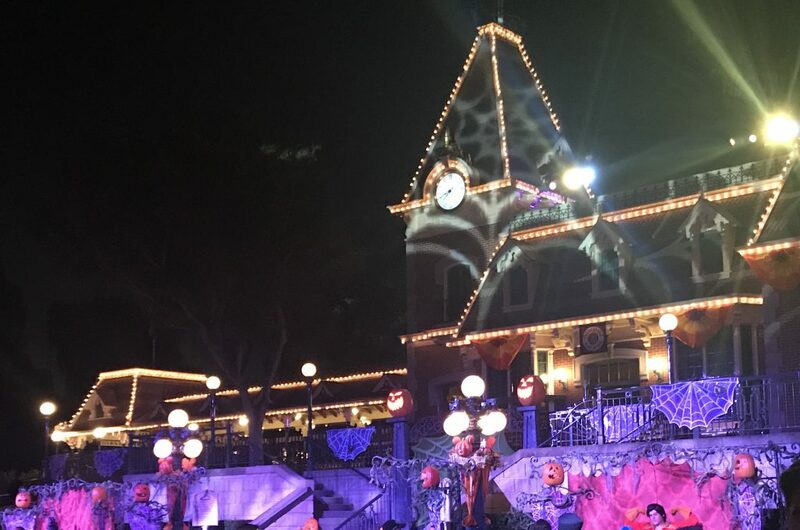 Overall, it was a very fun time for a Disney/Halloween-lover! That’s it for now– Carpe Kingdom! 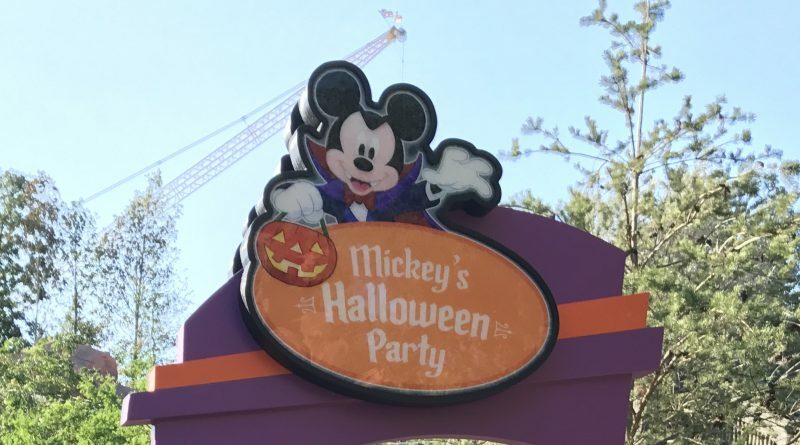 Did you go, or are you planning on going, to Mickey’s Halloween Party this year? What did you think? If you’ve been in previous years, how did it compare? Very descriptive post! Made me feel like I was there experiencing it with you. I haven’t been to Disneyland during the “Halloween” period but now this is totally on my bucket list. Hope to go next year. Thanks for all the info! That’s great!! 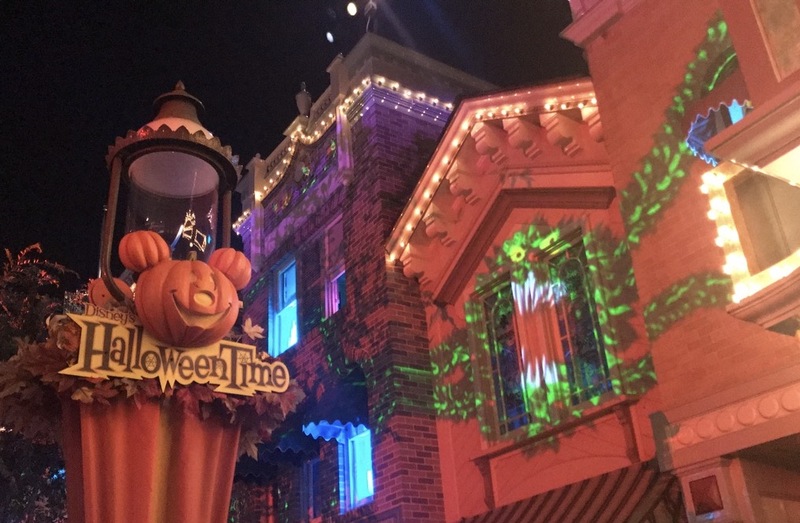 Whether you attend the actual Mickey’s Halloween Party, or just head into the parks in the fall, you should have a great time!